American approach and saw it as a threat to their deeply cherished religious belief that the gods intended for the bankers to have all the wealth of the world. So, the Bank of England lobbied King George III to impose the Currency Act on the colonies, which forbade the colonies to use their own money and required them to borrow their lawful tender from the Bank of England, at interest. As the above diagram shows, the Founding Fathers of this nation set up a simple economic system that did not rely on a private central bank. 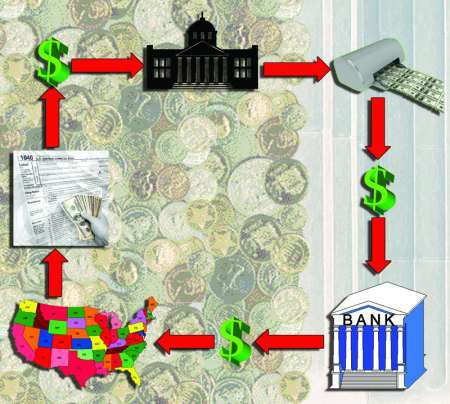 Government issued the public currency and spent it into circulation where it was used by the public free of interest. Then the money was taxed back into the government's hands, then to be re-spent back into circulation. For each fiscal year the money issued equaled the money collected. Nothing was lost. The dollar was based on a weight measure of silver, which meant the value of a dollar was fixed and not subject to the whims of government or bankers. This is a system which has worked very well for the civil population throughout history. It made the new nation immediately prosperous. This alarmed the European banking clans, which feared the American inspiration might spread to other nations (as it did to France in 1793). Where Britain's military might failed, politics succeeded and spurred on by Alexander Hamilton, the first Bank of the United States was granted a 20 year charter in 1791. Almost immediately, the spiraling debt in the government budget, championed as necessary for international commerce by Hamilton, began to drain the livelihood of ordinary Americans. The furor over the debt was one of many issues that led to the famous duel between Hamilton and Aaron Burr which resulted in Hamilton's death on July 11, 1804. As a side note, the pistols which were used in the duel are today in the possession of J. P. Morgan Chase & Co. Hamilton continues to be lionized by the private banking cartels he championed. The following year, with the conclusion of Britain's wars with Napoleon, the Bank of England demanded King George re-invade the United States to force them back into the clutches of private central banking, this time with the Bank of England. Thus was initiated the war of 1812, a war like any other war; created and waged for profit. In 1835, an unemployed painter, Richard Lawrence, attempted to shoot President Jackson twice, with both pistols failing to fire. Lawrence gave as his reason for the attack that with the President dead, money would be more plentiful, an obvious reference to Jackson's veto of the re-chartering of the Second Bank of the United States. As a footnote, following the loss of its charter, the Second Bank of the United States attempted to continue as an ordinary bank, but went bankrupt in 1841. As you can see, the main difference between the economic system created by the Founding Fathers and the current system is that the control of the printing presses has been given over to the private central bank. The government no longer prints up and spends the money it needs to operate, but BORROWS the money from the private central bank, at interest! Then the money is spent into circulation and winds its way through the population, and is then collected back in taxes. But here is the problem. Taxes now have to collect back MORE money than the government spent in order to pay the interest back to the private central bank. Over time, relentlessly, the private central bank is acquiring wealth from the population, in essence charging the people a fee for doing what the government itself originally did for free. That is the major difference between the economic system created by the nation's founders (the reason we fought a war to be free of the Bank of England) and the system we have today. It wasn't the coin that was the money, but the metal the coin contained. The bankers could only loan out as much money, based on silver or gold, as they had the silver and gold to cover in their vaults. The adherence to gold and silver as a unit of value was a major limitation on the banker's activities. However in order to make the currency work and to cover the escalating costs of the War, Lincoln was forced to abandon convertibility, meaning that the paper notes became the money and were not convertible to silver or gold (despite the flood of silver from the Comstock strike of 1857, which eventually led to Nevada's rapid statehood and Federal taxation in 1864). 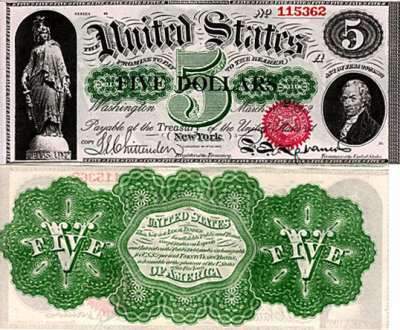 While there was inflation at the time, the government-issued currency, free of interest to a private bank, worked well during the war years, and Abraham Lincoln declared his intention to keep issuing the Greenbacks after the war's conclusion. This did not please the world's bankers at all. Following Abraham Lincoln's assassination, Congress voted to end the Greenbacks, but did not restore convertibility. Banks could issue notes without regard to actual bullion reserves and a period of intense post-war inflation and speculation resulted. In 1900 President McKinley kept a campaign promise to bring back convertibility by signing the Gold Standard Act, making the Gold Standard the basis for all US currency, even though much of the coinage issued remained silver. McKinley did this because of the public perception that the US Banking system was weak and corrupted, and because the gold strikes in California, Alaska, and Colorado bolstered the US Treasury's stock of that metal. One year later, President McKinley was assassinated by Leon Czolosz, who explained his attack at his execution saying,"I killed the President because he was the enemy of the good people – the good working people." In 1910, a group of private bankers met at a private island named Jekyll Island to plan the imposition of yet another private central bank on the people of the United States. As part of the ruse, they abandoned the unpopular name "Bank of the United States" and chose the name Federal Reserve to grant themselves the illusion that this was a government agency, when in point of fact it is just another privately owned central bank. Pretenses to the contrary notwithstanding, the Federal Reserve is no more "Federal" than Federal Express. It is a privately owned bank. Three years later, in 1913, Congress voted the Federal Reserve act and President Wilson signed it, redeeming a campaign promise to his financial backers. Six years later, as his Presidency came to a close, Woodrow Wilson wrote. Then President John F. Kennedy signed Executive Order 11110 on June 4th, 1963. This order authorized the Treasury to issue a new government currency, the US Note, based on silver in Fort Knox, recycled from the huge magnets used in early Uranium enrichment at Oak Ridge. This allowed the Kennedy administration to purchase four billion dollars worth of goods and services without having to borrow the money from the Federal Reserve, and signaled Kennedy's intention to restore the nations' economic system to the model used by the Founding Fathers. John F. Kennedy's United States Note. The following year, all silver coins and silver certificates were withdrawn from circulation. The media proclaimed the new clad coinage and the Federal Reserve Notes to be just as good as the silver money, and the entrapment of the American people was complete. From then on, all currency in circulation was worth what the private central bank said it was worth, and over time, it has been declared worth less and less. 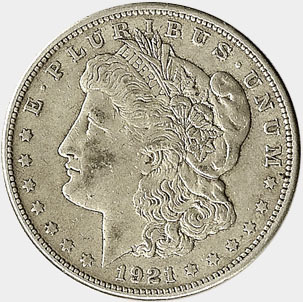 Just see how many "dollar" notes it takes to buy an original US Silver Dollar today! The system perpetuates only so long as an ever-larger group of new borrowers can be found to create new money to pay the interest on the old money. That is what makes it a pyramid. More money is created out of thin air in response to a loan, but the total debt still exceeds the total money supply. That is why the government and media always talk about the “growth” of the economy. “Growth” may sound like a good thing to the unenlightened, but in a debt-based economy, “growth” means “nation and its people deeper in debt-slavery". And because it is a pyramid, if the economy does not grow, that is, if more new debt cannot be created to service the interest on the old debt, the pyramid collapses, which is what is happening now. 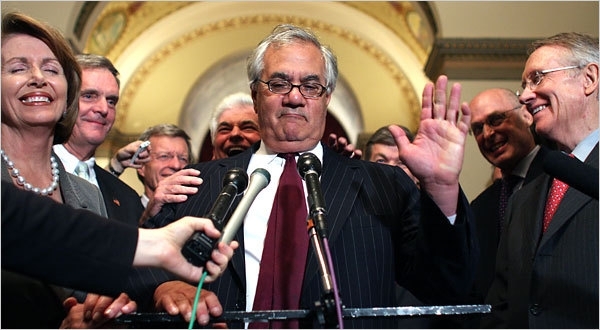 In 1999, the Gramm-Leach-Blily repealed the provision of the Glass-Steagall act that prohibited bank holding companies from owning other financial institutions, and dropped the barrier that separated banks and investment houses, allowing them to engage in each others business. This created a repeat of the exact same financial environment that had led to the crash of 1929. Those politicians who had championed deregulation, like Senator John McCain (a veteran of the Keating S&L Scandal of the 1980s), avoided keeping any oversight over the recently unchained financial system to ensure that past crimes were not being repeated. As a result, almost immediately after the repeal of Glass-Steagall, the banks and investment houses began to acquire and "flip" homes, to drive the prices up. The reason for the flipping should be obvious. Banks make their money off of interest on loans. The more people are forced to borrow, the more they have to work to pay the banks back. 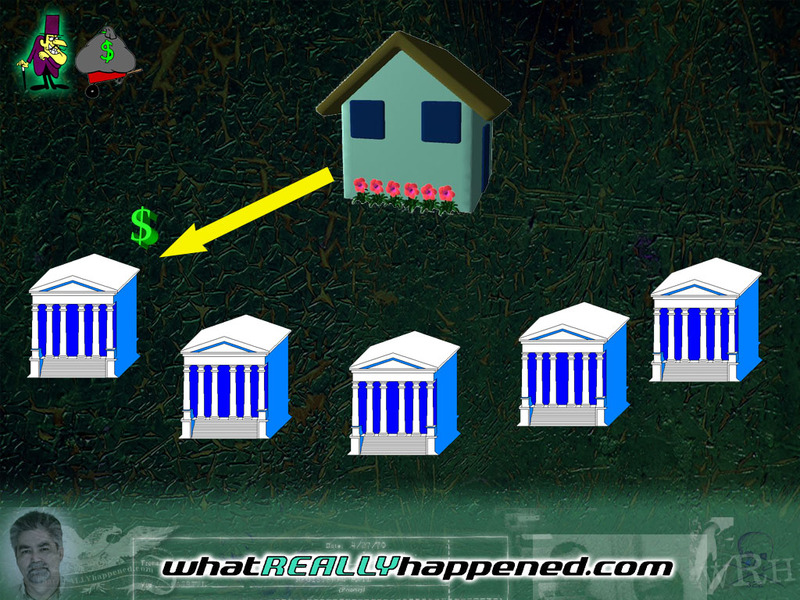 From a bank's point of view, a house that sells for only a few thousand dollars is useless. The ideal is that same house costing so much that a borrower will spend 30 years working off that paper debt, often paying the banks many times more in interest than the house itself originally cost. 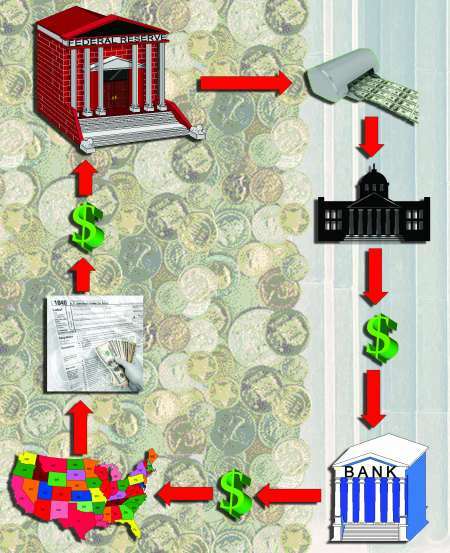 In a normal mortgage, the lender, who is a member bank of the Federal Reserve system, prints up a bunch of cash (or enters the amount of the loan into a computerized bank account) to loan to the mortgage applicant. This is not a joke; the money the bank hands to you to buy a house, or car, or iPod, is created out of thin air the moment you sign the loan agreement, credit card slip, or mortgage papers. Admit it; you thought the money for loans came from the bank's depositors, didn't you! Because after all, that's what you were taught in the state-controlled schools as a child! And they would never lie to you, would they? Remember that from an investor's point of view, the value of a home is not the home itself, but the debt the home creates and shackled the homeowner to, worth many times the cost of the actual house! That debt, which is pure profit, is sold to Americans as the "American Dream"; to work 30 years to pay the bankers many times what the house actually cost! (Some dream). Fortunes were being made and the politicians were neck deep in the greed. Starting in 2006, Wall Street operators got the ideas of taking debt obligations, and collecting them together to sell to other investors. The mortgage lenders would take their mortgages and "bundle" them, then sell the entire bundle for a flat fee. The advantage was that the mortgage lender recovered his money in a single large lump, while the investor buying the bundled mortgages would accept their return on investment over the lifetime of the mortgages. For long-term investors such as investment banks and pension funds, this was an ideal investment so long as all the mortgages were paid on time every month. The investment looked sound as long as real-estate prices kept soaring, and nobody was taking too close a look at the individual mortgages. Because the banks and mortgage companies were passing the mortgages onto outside parties, there was little incentive to look too closely at the borrowers, while financial incentives encouraged the mortgage writers to over-inflate earnings and home values on the applications to push the deals through. The mortgage bundlers, drunk on the instant profits falling like manna from heaven, started taking some reckless steps. Mortgage analysis companies like Clayton Holdings were reporting to the clients at the big banks that many of the so-called sub prime mortgages did not meet basic underwriting requirements, either for the private banks or for the three "F"s, Fannie Mae, Freddie Mac, and FHA. But the mortgage bundlers blended the sub prime with prime mortgages and sold off the bundles as "Mortgage Backed Securities" or "Collateralized Debt Obligations". In other words, the mortgage bundlers knew many of the mortgages in those bundles were not going to perform well, but did not tell the investors who bought them, then invested in "derivatives", basically betting those MBS and CDOs would fail! 17. 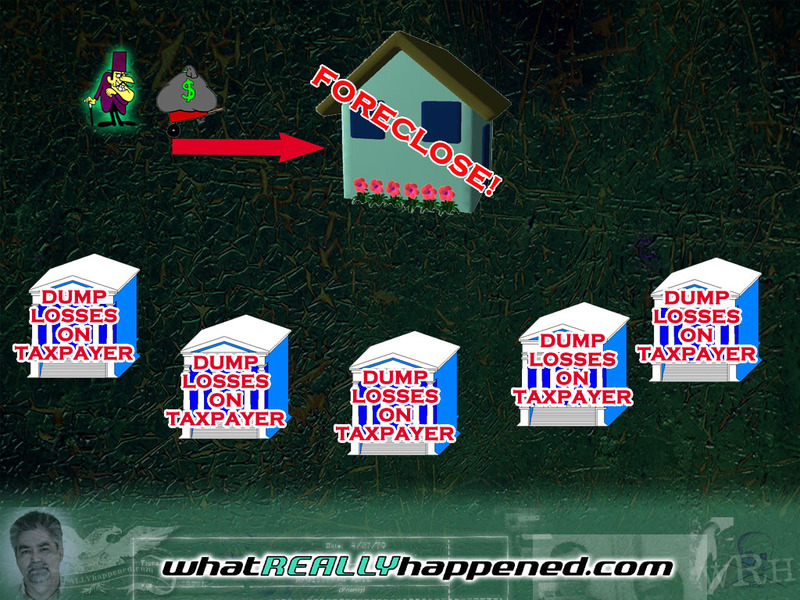 IT ISN'T THE FORECLOSURES, IT'S THE FRAUD! 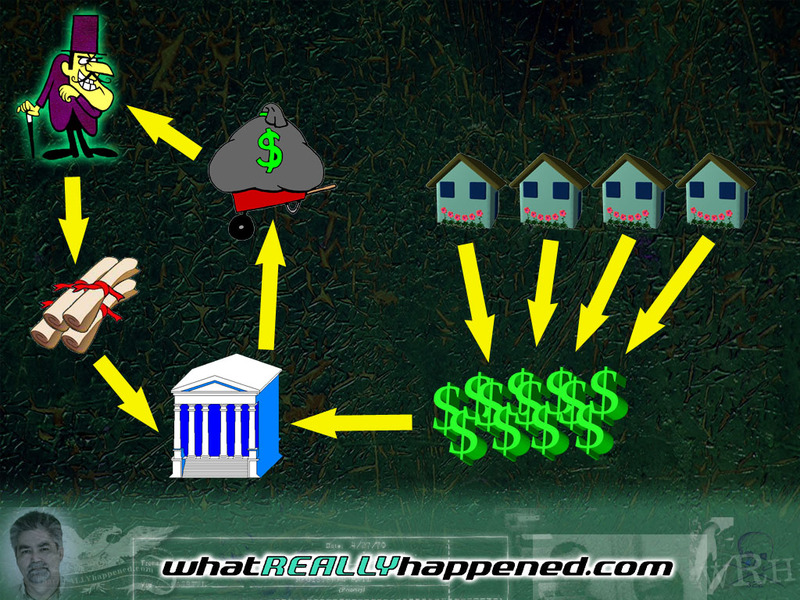 The problem is that some of the mortgage bundlers were greedy! They needed more mortgages to feed the giant mortgage-backed-security bubble they were inflating. So they started luring in borrowers with borderline credit into "sub-prime" mortgages. Since members of the US Congress were invested in the very companies that were reaping giant profits on those mortgage-backed-securities, Congress voted through an $8000 tax credit for first-time home buyers to bait them into the scheme! But still there were not enough new mortgages. Investors were clamoring for more mortgage-backed-securities to buy. Then the bankers had an inspiration. They realized that while you can only sell a house to one owner at a time, you can in theory sell the mortgage over and over, since it is a piece of easily copied paper or more likely a computer record in MERS, the Mortgage Electronic Registration System, a computer system created to evade title transfer fees and to speed up the churning of the mortgages as they shuffled from one investment company to another! MERS initially helped conceal the over-selling of mortgages, but eventually the scam became known, and numerous major banks have been exposed for selling the same mortgage into multiple mortgage-backed securities, generating vast profits for the bundlers. 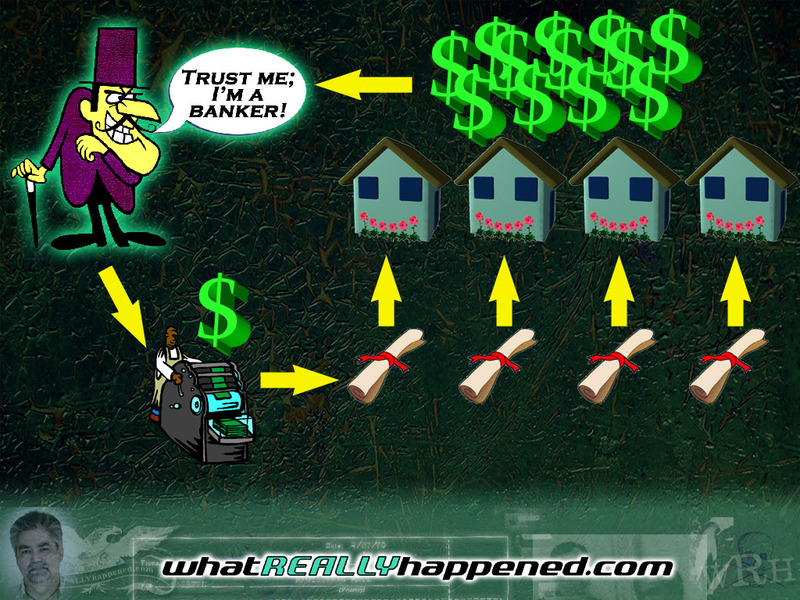 While this "reserve" approach to mortgages may have looked okay to the bankers, who saw the world through money-colored glasses, it is in fact a crime! In February 2009 CNBC broke the story that many of the mortgage bundlers had pledged individual mortgages as collateral over and over into different CDOs, when legally, they can be pledged as collateral only once. Chris Whalen tells CNBC's Larry Kudlow that Bear Stearns will be exposed as having sold the same loan to different investors on numerous occasions. But there is another problem with over-selling mortgages. For every copy of a mortgage bundled into an investment, there is an investor expecting a mortgage payment every month. Obviously the home buyer, who has signed only one mortgage, is making only one mortgage payment. For the extra copies of that mortgage there are no monthly payments coming in. As long as only a few mortgages in the bundle are underperforming, nobody noticed, but as the jobs left America and more and more home buyers started to fall behind, the risk that the over-selling scheme would be exposed to public scrutiny and condemnation (not to mention arrest and prosecution) began to be apparent! 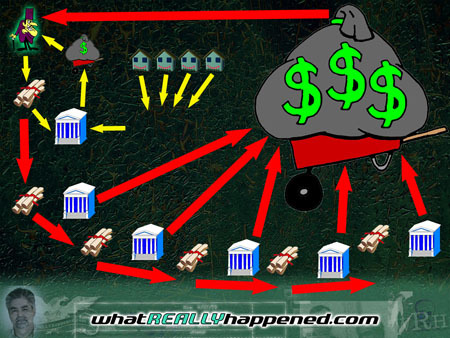 Those mortgage-backed securities with multiply-assigned mortgages ARE the "Toxic Assets" Congress was screaming about when they forced the Troubled Asset Relief Program through Congress in the fall of 2008, despite overwhelming public opposition. The mortgage bundlers had stuck key financial institutions with fraudulent mortgage-backed securities, and Congress voted to loot the public to purchase the useless paper and hide it from public scrutiny. Why? Because the members of the US Congress had their own fortunes invested in those fraudulent mortgage-backed securities. Had the institutions collapsed, members of Congress would have been ruined as well. So they saved their own investments by dropping the losses on the American people! Commercial real estate was caught up in the mortgage-backed securities mania, and eventually the US Government used $3 trillion in taxpayer funds to deal with that growing catastrophe! In other cases, the Federal Government has been exposed as intentionally concealing the scale of the losses from the American taxpayer, even to the point of hiding billions in bailout payments, further fueling speculation that the major "Too Big To Fail" banks have indeed already failed and are technically insolvent. This brings us to the interesting sidebar of John McCain's candidacy for President. All seemed to be going well for him until in a move that surprised many political observes, McCain chose as his Vice President Alaska Governor Sarah Palin. McCain's claim that he needed a female Vice President seemed reasonable, but there were far more qualified women out there such as Hawaii's Governor Linda Lingle, who was not even contacted by McCain's campaign. In hindsight, it almost seemed McCain was intentionally destroying the credibility of his own campaign, and now a possible motive surfaces. If it was already known that the mortgage-back securities had become toxic assets, and that the taxpayer was going to be made to foot the bill, what better plan for the Republicans that had created the mess to drop the task of screwing the American people onto the Democrats, including a man willing to do anything to be America's first black President! And it appears to have worked as the same Republicans that created this financial mess appear poised for a mid-term return to control of the White House. But while the US Government using taxpayer money was buying back the fraudulent uncollateralized mortgage bundles, the holders of the genuine mortgages were still faced with a problem. The trail of documents through MERS was a hopeless rats' nest! Mortgage Service companies were forced to go into court without all the required documents, and judges, failing to see the actual debt note or title before them,. were starting to throw foreclosure cases out! Representative Marcy Kaput got up in Congress advising homeowners to demand the foreclosers to prove they owned the actual loan! So a new creature came into being, the "Foreclosure Document Mill", small start-up companies which for a fee would "re-create" missing paperwork to allow the foreclosures to pass a judge's scrutiny. But the foreclosure mills were also faced with the confusion in the MERS system and under pressure to perform, were hiring virtually anybody willing to engage in a little "gray" paperwork, hiring Wall Mart floor walkers, former beauticians, factory workers, and putting them in offices with no formal training to process foreclosure paperwork. According to one whistle blower, workers who produced large amounts of "re-created" documents were rewarded with cars and jewelry! Computerized processing systems cranked out foreclosure lawsuit paperwork by the reams! But with individual mortgages being sold out as many as 20 different times, the mortgage bundlers faced a huge problem. Every home payment made has to be repaid to the investor in the MBS for every time that mortgage was resold, that is to say for every dollar paid by the home-owner, the mortgage bundler is on the hook for up to $20 owed to the holders of the mortgage backed securities. In that context, the banks have a huge motive to foreclose on homes to limit the losses on those oversubscribed mortgage backed securities! Once the home is foreclosed, payments on those over-subscribed mortgage backed securities stop and the criminals who over-sold those mortgages are off the hook. It is not unlike the Mel Brooks movie "The Producers" in which the producers intentionally choose what they think is a terrible script, "Springtime for Hitler", which they hope will close the first night. The producers then over-subscribe the investment in the play by 1000%. 100% is spent producing the show, with the other 900% to be pocketed after the show fails and the investors, unaware of the extra shares in the show, accept their losses and leave. The only solution I can think of (short of armed rebellion and guillotining the culprits) is rather drastic, and not even original with me. In Tom Clancy's book "Debt of Honor" a stock market crash is exacerbated when the computer systems used to track transactions are sabotaged. That seems a good metaphor for the runaway mortgage-backed Securities market compounded by MERS allowing (or fraudulent bankers causing) mortgages to be placed in multiple investment bundles. The inspiration in the book is a phrase heard often in science;"If you didn't write it down, it did not happen!" And in the book, the solution is to simply discard everything that happened after the last good record and restart the machinery at that point. The stock market re-opens with the last good trade before the computers were sabotaged and everybody goes home happy, eventually. The Government will not, indeed cannot ever admit error, even though, like the Gulf Oil Disaster and the Bernie Madoff scandal, the government's job was to prevent this from happening, not bait more victims into the scam with a tax credit.But having swindled the American people out of trillions of dollars to buy back and conceal the fraudulent non-collateralized mortgage securities, the US Government is now clearly an accessory to the crime, if after-the-fact. The original fraud with the mortgage-backed securities was covered up ahead of the 2008 election, and it appears Obama is trying to do the same for the 2010 elections, announcing a Federal criminal investigation which will supposedly look into the bankers' possible illegal activity, but in reality is intended to block criminal investigations already underway in all 50 states. CNBC reports that Congress may simply retro-actively declare the fraud to be legal, ending all investigations and indemnifying the bankers from criminal prosecutions. That the relentless looting of the public treasury to cover-up this disaster has harmed the nation is beyond doubt. Trillions that might have paid for new schools and roads and hospitals has vanished into the black hole of Wall Street, to buy up bad paper and feed it to the shredder before the public finds out that once again, as is typical of a fascist economy, the poor are made to pay for all! People without mortgages, people who have never bought a home, are all harmed by this disaster. We are all victims of the rampant and reckless greed that consumes the money addicts in the halls of power. 43 million Americans are on food Stamps, and according to Barron's Magazine(October 11, 2010), unemployment is at 22%, which is depression levels. Meanwhile, Wall Street executives will collect bonuses this year totaling 8% of all the US cash in circulation!